It's a lovely name, don't you think? One of the pictures had the model's name, Lola Rose. I tried the name out inside my head. I liked it. 'I'll be Lola Rose.' I stood up straight, tossed my hair, smoothed my nightie. 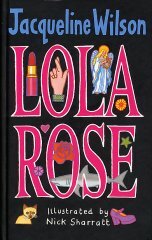 Lola Rose sounded a seriously cool girl. She had long, thick, curly hair (my fine, straight hair seemed thicker and curlier already). Lola Rose had a perfect model figure. I sucked in my tummy and stuck out my chest. Lola Rose wasn't scared of anyone. Not even her dad. I breathed out slowly, a little smile on my face. Jayni isn't the only one who's scared of her dad. Her mum is scared too. He hits them, you see. Well, he's always had a go at her mum. He gets angry quickly. But he only has to hit Jayni once, and that is enough for her mum. They pack their bags while her dad is down the pub, and slip out of the flat, Jayni, her brother Kenny, and her mum, Nikki. Course, it helps that Jayni's mum's handbag is stuffed full of fivers that she won on a scratchcard. That's what caused the argument at home in the first place, the money, and that is what keeps the three of them together for the first few weeks in London, while they sort out a new life for themselves, and have a nice time. They have a great time. They stay in a fancy hotel, and buy new clothes, and enjoy a few treats. Kenny just loves the sharks in the London Aquarium. Lola Rose can't face the sharks - that's because she is still the bruised and nervous Jayni underneath, dreaming nightmares about her dad coming to find them. The money can't last for ever though, not at the rate that they are spending. And that is when they all begin to realize that it isn't as easy as you might think, just to start a new life. Some problems you carry round with you, and all problems have to be sorted out, sooner or later.